Tim Lambesis is back in the news, but for once it has nothing to do with his solicitation of murder trial. It’s back to music as Austrian Death Machine is set to release their latest effort, Triple Brutal, on April 1st. Formed as both a tribute and a parody of Arnold Schwarzenegger testosterone films, Austrian Death Machine released Total Brutal in 2008 and the follow-up Double Brutal in 2009. 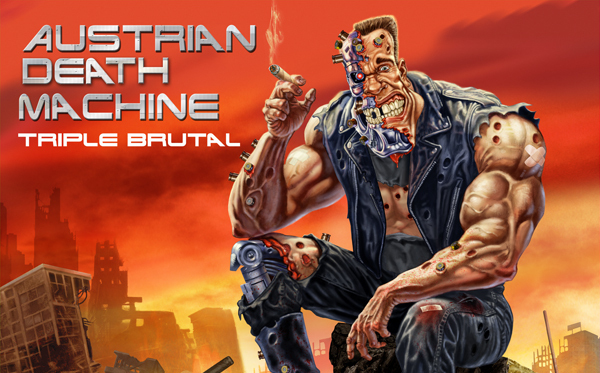 A funding campaign on indiegogo put Austrian Death Machine’s Triple Brutal on to the table. Recorded in late 2012 and early 2013, the recording was finished prior to Lambesis’ arrest. Triple Brutal will be made available through Artery Records. Pre-orders can be found through this link.